Saturday November 22nd at 3PM, conversation between Joanne Bland, Jeremiah Day, and Jackie Sumell. This interdisciplinary afternoon will include contemporary art and grass-roots memory, looking at the role of the guide, witness, story-teller: an afternoon of performance, presentation and discussion taking up the problem of memory and politics in a spirit of peer dialogue and public reflection. The presentations will be followed by a moderated discussion. The afternoon is organised in collaboration with Xavier University’s Art Department and the Department for Communication Studies. Coffee and snacks will be served. The afternoon will feature a special presentation by Joanne Bland, a legend in the circles of civil rights history-making, co-founder of the National Voting Rights Museum and the youngest marcher on ‘Bloody Sunday’ which led to the Selma-to-Montgomery March and ultimately to the passage of the Voting Rights act of 1965. Joanne has in recent years developed a unique storytelling- guide practice, giving tours of Selma that tell the story of ‘Bloody Sunday’ as an entry point to the broader history and its meaning for today. Joanne will introduce and then reflect upon her own work and the situation we find ourselves in. Jeremiah Day’s work employs photography, speech, and improvisational movement. Questions of site and historical memory are explored through fractured narratives. Day works with what writer Fred Dewey has called ‘the non-fictional imagination,’ reflecting on sites of memory and politics to produce metaphors to help with our contemporary struggles. 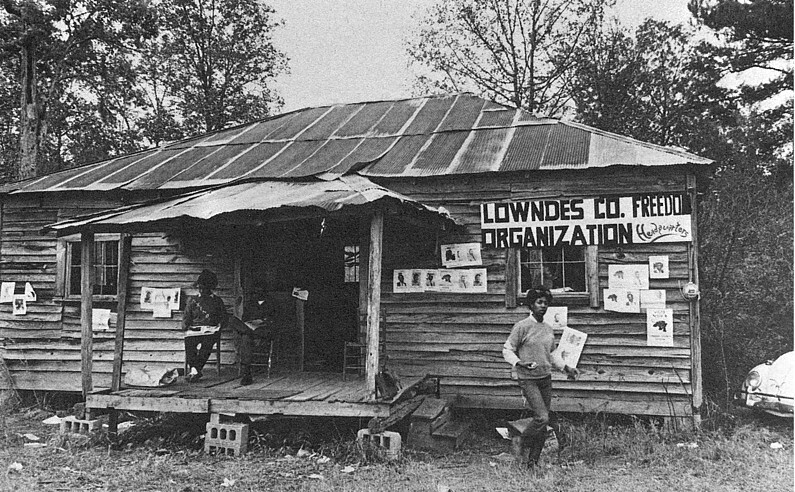 In 2008, Day had a working residency in Alabama to understand and commemorate the Lowndes County Freedom Organisation – an independent political party dedicated to civil rights that came out of the Selma-Montgomery March and is famous for being the originator of the Black Panther icon. Day will show his ‘Lowndes County: Prologue’ performance and present his new design for a monument to the LCFO. Jackie Sumell’s background is in the visual arts, but her multi-disciplinary practice is itself a form of engagement with public life. Her epic project ‘The House That Herman Built’ began from a dialogue with Herman Wallace, one of the Angola 3 held for decades in solitary confinement and considered by many to be a political prisoner for his prison activism aligned with the Black Panther Party. Sumell worked with Wallace to design his dream house, a kind of public portrait/protest project. Since Wallace’s passing away last year (only a few days after finally securing his release from prison), the project continues and now becomes a kind of monument to the man and the issues that his story embodies.